In summer, it feeds on plants such as, grass, ferns and leaves; in winter, it eats twigs, the bark from trees, and buds from flowers and plants and, similar to the Arctic hare, has been known to steal meat from baited traps. Hares are carnivorous under the availability of dead animals, and have been known to eat dead rodents such as mice due to low availability of protein in a herbivorous diet. It can sometimes be seen feeding in small groups. This animal is mainly active at night and does not hibernate. The snowshoe hare may have up to four litters in a year which average three to eight young. Males compete for females, and females may breed with several males. A major predator of the snowshoe hare is the lynx. Historical records of animals caught by fur hunters over hundreds of years show the lynx and hare numbers rising and falling in a cycle, which has made the hare known to biology students worldwide as a case study of the relationship between numbers of predators and their prey. ↑ Hoffman, R.S. ; Smith, A.T. (2005). "Order Lagomorpha". In Wilson, D.E. ; Reeder, D.M. Mammal Species of the World: A Taxonomic and Geographic Reference (3rd ed.). Johns Hopkins University Press. p. 195. ISBN 978-0-8018-8221-0. OCLC 62265494. ↑ Murray, D. & Smith, A.T. (2008). "Lepus americanus". IUCN Red List of Threatened Species. Version 2009.2. International Union for Conservation of Nature. Retrieved 1 February 2010. 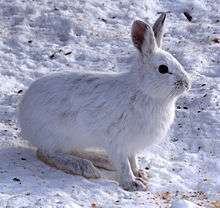 ↑ "Snowshoe Hare". eNature: FieldGuides. 2007. Retrieved 2008-03-23. ↑ Krebs & Myers. "The Snowshoe Hare 10-year Cycle – A Cautionary Tale". Ecological Rants. University of British Columbia. Retrieved 7 October 2015. ↑ "Predators and their prey". BBC Bitsize. BBC. Retrieved 7 October 2015. ↑ Pietz, Pamela J.; Tester, John R. (1983). "Habitat selection by snowshoe hares in North Central Minnesota". Journal of Wildlife Management. 47 (3): 686–696. doi:10.2307/3808604. JSTOR 3808604. 1 2 3 4 5 Giusti, Gregory A.; Schmidt, Robert H.; Timm, Robert M.; [and others]. 1992. The lagomorphs: rabbits, hares, and pika. In: Silvicultural approaches to animal damage management in Pacific Northwest forests. Gen. Tech. Rep. PNW-GTR-287. Portland, OR: U.S. Department of Agriculture, Forest Service, Pacific Northwest Research Station: 289–307. ↑ Rongstad, Orrin J.; Tester, John R (1971). "Behavior and maternal relations of young snowshoe hares". Journal of Wildlife Management. 35 (2): 338–346. doi:10.2307/3799610. JSTOR 3799610. ↑ O'Donoghue, Mark (1994). "Early survival of juvenile snowshoe hares". Ecology. 75 (6): 1582–1592. doi:10.2307/1939619. JSTOR 1939619. 1 2 Sinclair, AR; Gosline, JM; Holdsworth, G; Krebs, CJ; Boutin, S; Smith, JN; Boonstra, R; Dale, M (1993). "Can the solar cycle and climate synchronize the snowshoe hare cycle in Canada? Evidence from tree rings and ice cores". The American Naturalist. 141 (2): 173–98. doi:10.1086/285468. PMID 19426078. 1 2 3 Koehler, Gary M. (1990). "Population and habitat characteristics of lynx and snowshoe hares in north central Washington". Canadian Journal of Zoology. 68 (5): 845–851. doi:10.1139/z90-122. ↑ Pease, James L.; Vowles, Richard H.; Keith, Lloyd B (1979). "Interaction of snowshoe hares and woody vegetation". Journal of Wildlife Management. 43 (1): 43–6. doi:10.2307/3800634. JSTOR 3800634. 1 2 Litvaitis, John A.; Sherburne, James A.; Bissonette, John A (1985). "Influence of understory characteristics on snowshoe hare habitat use and density". Journal of Wildlife Management. 49 (4): 866–873. doi:10.2307/3801359. JSTOR 3801359. ↑ Litvaitis, John A (1990). "Differential habitat use by sexes of snowshoe hares (Lepus americanus)". Journal of Mammalogy. 71 (4): 520–523. doi:10.2307/1381790. JSTOR 1381790. 1 2 Wolfe, Michael L.; Debyle, Norbert V.; Winchell, Clark S.; McCabe, Thomas R. (1982). "Snowshoe hare cover relationships in northern Utah". Journal of Wildlife Management. 46 (3): 662–670. doi:10.2307/3808557. JSTOR 3808557. ↑ Sullivan, T. P.; Sullivan, D. S. (1988). "Influence of stand thinning on snowshoe hare population dynamics and feeding damage in lodgepole pine forest". Journal of Applied Ecology. 25 (3): 791–805. doi:10.2307/2403746. JSTOR 2403746. ↑ Gashwiler, Jay S (1970). "Plant and mammal changes on a clearcut in west-central Oregon". Ecology. 51 (6): 1018–1026. doi:10.2307/1933628. JSTOR 1933628. ↑ Gilbert, B. Scott; Boutin, Stan (1991). "Effect of moonlight on winter activity of snowshoe hares". Arctic and Alpine Research. 23 (1): 61–65. doi:10.2307/1551438. JSTOR 1551438. ↑ Adams, Lowell (1959). "An analysis of a population of snowshoe hares in northwestern Montana". Ecological Monographs. 29 (2): 148–153. doi:10.2307/1942201. JSTOR 1942201. ↑ O'Farrell, Thomas P. (1965). "Home range and ecology of snowshoe hares in interior Alaska". Journal of Mammalogy. 46 (3): 406–418. doi:10.2307/1377626. JSTOR 1377626. ↑ Snowshoe Hares, Snowshoe Hare Pictures, Snowshoe Hare Facts – National Geographic. Animals.nationalgeographic.com. Retrieved on 2011-12-11. 1 2 Wolff, Jerry O (1978). "Food habits of snowshoe hare in interior Alaska". Journal of Wildlife Management. 42 (1): 148–153. doi:10.2307/3800702. JSTOR 3800702. ↑ Dodds, Donald G (1960). 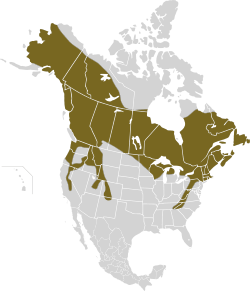 "Food competition and range relationships of moose and snowshoe hare in Newfoundland". Journal of Wildlife Management. 24 (1): 52–60. doi:10.2307/3797356. JSTOR 3797356.